Psoriasis is a persistent skin disorder in which there are red, thickened areas with silvery scales, often on the scalp, elbows, knees and lower back. Some cases are mild, while others are severe and cover large areas of the body. Psoriasis is not contagious, but sometimes it can be inherited, so there may be a family history. While the cause is not specifically known, recent discoveries show an abnormality in the functioning of special white cells, called T-cells, which trigger inflammation and the immune response in the skin. This causes the skin to grow too rapidly. Dead skin cells subsequently build up too fast and then thick plaques form. In some cases, this process can be activated by infections, such as strep throat, and by certain medications. Dermatologists diagnose psoriasis based on a skin exam. If the diagnosis is not clear, a skin biopsy may be helpful. The goal is to reduce the inflammation and to control the scale build-up as well as the shedding of the skin. Fortunately, there are many different forms of treatments available. Prescription medications include topical creams such as steroids, anthralin, vitamin D, retinoids and coal tar. The goal of these medications is to have an anti-inflammatory effect as well as to help soften and break up the excess scale. 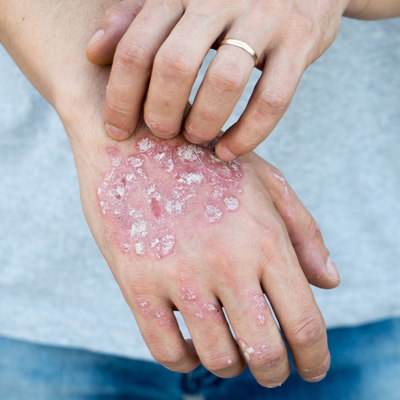 If the psoriasis is more severe and widespread, or unresponsive to topical treatments, then your dermatologist can discuss other alternatives such as systemic medications and light therapy. What Systemic Medications are Available? Methotrexate is an oral anti-cancer medication usually taken once a week that can produce dramatic clearing of psoriasis. Retinoids related to vitamin A may be taken daily. Cyclosporine is an oral immunosuppressant used when other treatments have failed. There is a class of medications called biologic agents that are a more recent option for patients suffering with psoriasis. These are administered by injections done at home or in the office ranging in frequency from twice a week to four times a year. All systemic medications may produce some side effects which would be reviewed with you by your dermatologist when deciding if one of these would be appropriate. The potential side effects are monitored by checking blood tests, urine tests, blood pressure, and/or chest x-rays, depending on the medication and your history. If someone is affected by psoriasis in both their skin and their joints, some of these systemic medications can help both forms of psoriasis. Pustular psoriasis may be localized to certain areas of the body, such as the hands and feet, or may cover most of the body. It begins with the reddening of the skin followed by formation of pustules and scaling. What are Light Treatments and How Do They Work? Sunlight and ultraviolet light slow the rapid growth of the skin cells which has been shown helpful to those with psoriasis. Exposure to sunlight may be helpful to those with psoriasis, but can cause side effects such as skin cancer, skin wrinkling and eye damage. Researchers have studied the entire spectrum of ultraviolet light to determine which wavelengths are most helpful to patients with psoriasis. These specific wavelengths can be delivered to the skin with special light treatments given in the dermatology office which offers better results with fewer side effects than sunbathing outside. For patients with widespread psoriasis, a stand-up tanning booth in the office can deliver specific UVA or UVB rays. If a patient has a few localized areas of psoriasis, a new laser called the Xtrac laser can deliver the wavelengths of light to only those areas. This treatment greatly reduces potential side effects because the skin that is not affected by psoriasis can be left alone and not exposed to the ultraviolet light. For best results, patients are advised to come in to the office two to three times per week for treatments. All these light treatments are available at Brinton Lake Dermatology and are usually covered by health insurance plans. The above treatment options can be used alone or in combination. They can clear or greatly improve psoriasis in most cases, but no treatment permanently cures the disease. Researchers are continually testing new drugs and treatments. If you have psoriasis or suspect you do, call for an appointment at Brinton Lake Dermatology and we will perform a skin evaluation and design a treatment plan for you.